The Pistons may have lost their first-round pick in this year’s draft, but at least they were able to snag the best mustache in the bunch by taking Colorado junior guard Spencer Dinwiddie with the 38th overall pick. Though potentially great players were all over the board late into the first round, the Pistons still found significant value by taking a player who suffered an ACL injury this year and fell down draft boards because of it. Dinwiddie is a PG/SG tweener with the size to play the latter but the mindset of the former. I know, I know, Rodney Stuckey, but Dinwiddie is not Stuckey, nor will he be relied up as the future centerpiece of the franchise. This is not to imply that they’re they same player—they’re not—but it’s clear that this selection was more about value than fit. 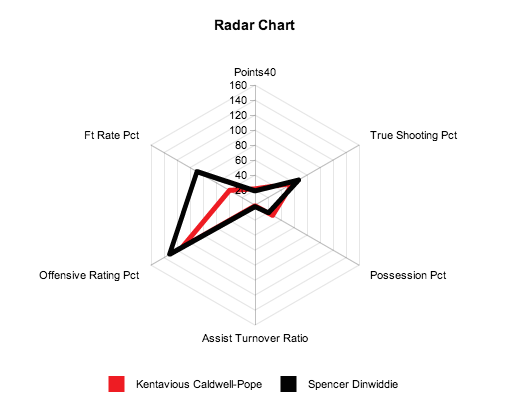 Dinwiddie plays more like a point guard than a shooting guard, and while he excels at distributing the ball, he’s much more of a scoring guard than a true point guard. Dinwiddie is not a Michael Carter-Williams clone; he showed serious NBA range during college. Though his sophomore season saw a dip in his outside shooting (his 3FG% dropped exactly 10% from his freshman year), his abbreviated junior season saw a return to form, shooting 41.3% in 17 games beyond the arc. Caveats do apply here: as a major-conference school, the early parts of the schedule are loaded with body bag games. Against the better teams in that stretch (Baylor, Kansas, Oklahoma St., and Oregon) he looked more like he did during his sophomore year. In those four games, Dinwiddie went 9-24 from inside the arc and 7-19 from outside. Unfortunately, there’s not a lot of middle-ground teams on his junior-year resume to evaluate. Dinwiddie went 4-5 against Georgia, including 2-3 from outside; and 5-9 against Harvard, including 4-7 from outside. Other than that, it’s cupcake after cupcake. The offense that the Pistons will get from Dinwiddie may be in question. One thing remains for certain: the kid can catch and shoot better than anyone not he roster other than Jodie Meeks, a skill that will be crucial if Stan Van Gundy is going to implement his Andre Drummond-led 4-in, 1-out offense. His defensive potential is high but not elite. Lacking true NBA athleticism will hinder his ability to guard quicker players, especially if he’s tasked with staying in front of smaller point guards. However, his length and ability to anticipate passing lanes make him a fast break waiting to happen. Where Dinwiddie projects on this roster is tough. He’s unlikely to see much time at shooting guard with Meeks and KCP already on the roster. Brandon Jennings (and possibly Isaiah Thomas, if a deal is made between the Pistons and Kings) has the point guard position pretty well locked up. And Dinwiddie may struggle to defend NBA small forwards. At this point, he’s simply another bullet in SVG’s chamber. Dinwiddie was a smart draft pick with a lot of upside, and with SVG’s track record of making players realize their potential, he could quickly turn into a valuable player and asset for the franchise.